(FIX) To recycle or not to recycle: that is the question. We all need to play a part in protecting the environment for ourselves and for future generations. Whether you’re biking to work or lugging plastic containers to the supermarket recycling bin, every little bit helps. However, when it comes to recycling the items we use on a daily basis – from AA batteries to large appliances – how can we make sure we’re doing everything possible to protect the environment? We’re here to guide you through the recycling tide, product by product. Sure, you could throw these worn-out little pods of energy into the trash and no one would be the wiser. But should you? 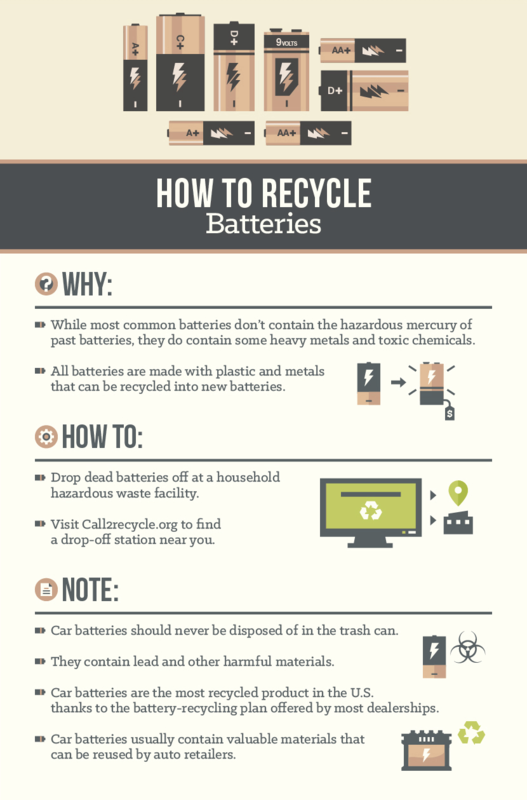 In the past, the most commonly used batteries were manufactured with mercury, posing a threat to landfills. Thankfully, today’s batteries are a far cry from the mercury-laden predecessors that lined the shelves prior to 1997. That’s when Congress passed the Mercury-Containing Battery Management Act, which phased out the mercury content in battery production. Since then, battery manufacturers have produced and sold mercury-free alkaline batteries, which soon became the norm. Today, the most common batteries (AAs, AAAs, Cs, Ds, and nine-volts) do not contain added mercury, with two exceptions: mercuric-oxide batteries and button-cell batteries. Since most modern alkaline batteries no longer contain mercury, people generally believed that they don’t harm the environment as much as they once did and that it’s okay to toss them in the trash. However, most common batteries still contain some heavy metals, such as lead, cadmium, and nickel, which can harm the environment if they’re not properly disposed of. In addition, alkaline batteries are made with potassium hydroxide, a strong alkali that can gradually leak out of old batteries. This leak often manifests as corrosive crystalline growths that coat the outside of old batteries and that can cause chemical burns and skin irritation if touched. If not disposed of properly, these caustic growths can also damage the surrounding environment. If you would like to go that extra environmentally friendly mile, it’s much better to drop dead batteries off at a household hazardous waste facility than to toss them in the trash. Now that we’ve tackled the exciting world of common alkaline batteries, let’s talk about rechargeables. While the idea behind rechargeable batteries is that you never have to replace them, buying new models of cell phones, MP3 players, and tablets means tossing out the old ones. As new and improved versions of the latest can’t-live-without-them smartphones hit the market every year, rechargeable batteries are tossed in the trash at an astonishing rate, causing massive amounts of dangerous e-waste in our landfills. Like conventional batteries, rechargeable batteries contain potentially toxic heavy metals such as lead-acid, nickel-cadmium, and nickel-hydrogen that may harm the environment if they’re not disposed of properly. To do right by these little energy sources, all rechargeable batteries should be dropped off at a proper recycling station. The Rechargeable Battery Recycling Corporation (RBRC) collects used rechargeable batteries. Use the Call 2 Recycle locator to find a drop-off station near you. It’s much easier to throw light bulbs in the trash and forget about them than to carry around these fragile glass items until you find a proper recycling facility. When we improperly discard of products that contain mercury, we increase the amount of mercury that is incinerated in our landfills, which heavily contaminates the environment and subsequently risks our own health. Because almost all the glass and metals in fluorescent lightbulbs is recyclable, the EPA recommends taking used lightbulbs to a local CFL recycling program. In most cases, large home-improvement stores, such as IKEA and Home Depot, offer recycling services. You can check with your local hardware store to see if it also has a CFL drop-off service. 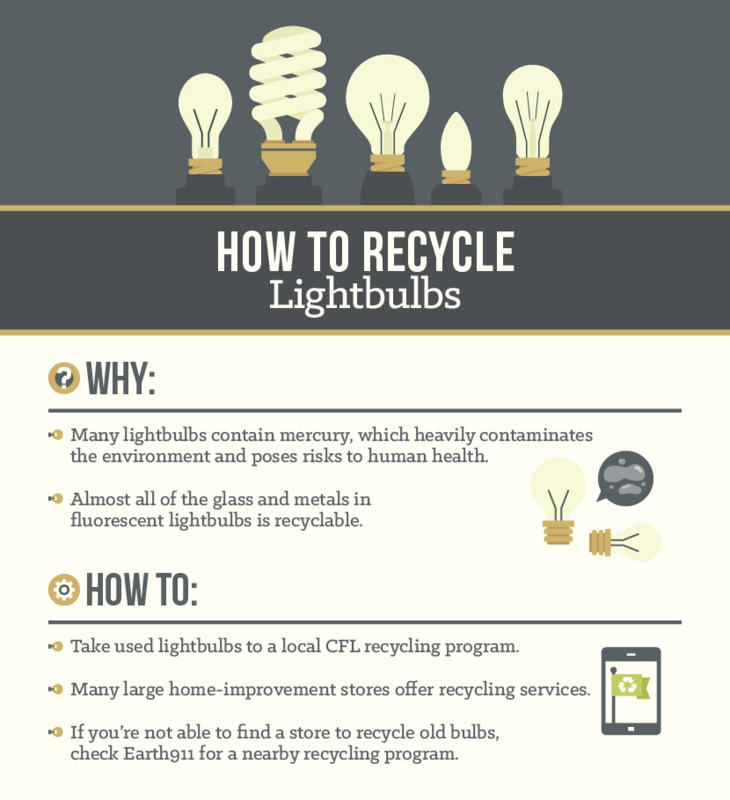 If you can’t find a local store to recycle your old bulbs, check with Earth911 to find a lightbulb-recycling program in your area. There are two types of household paint: oil-based and latex. Oil-based paint (often referred to as alkyd paint) is considered a hazardous waste product due to the number of toxic chemicals and minerals it contains. Oil-based paint is a solvent that contains volatile organic compounds (VOCs) that are released into the environment as smog after coming in contact with sunlight. In addition, the heavy metals and phthalates found in oil-based paint are toxic to both humans and the environment. 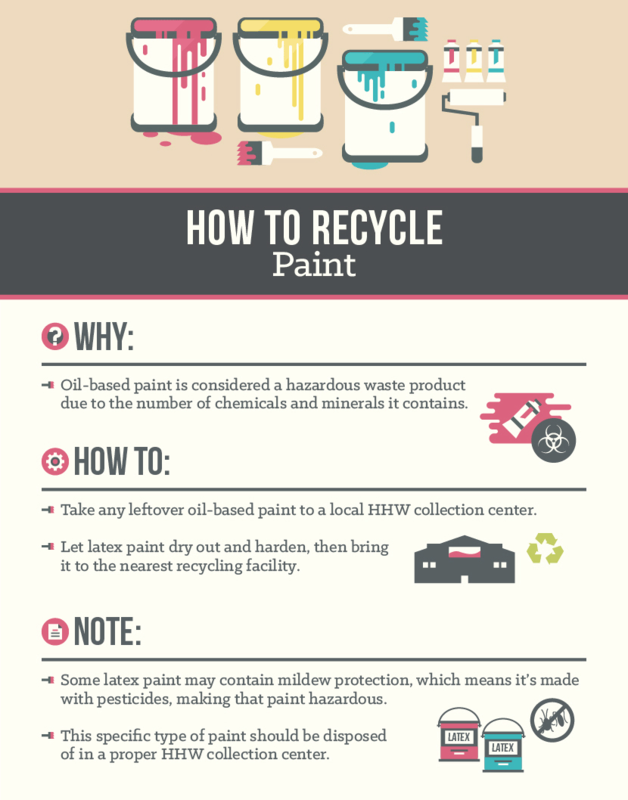 Oil-based paints should always be taken to a local household hazardous waste (HHW) collection center so they can be properly disposed of. Latex paint, however, is not considered hazardous, and it can be recycled into new paint. Earth911 recommends letting latex paint dry out and harden to prepare it for the recycling process. Once it is dry, take the container to the nearest recycling facility. Some states have specific recycling procedures and programs for old paint. Contact your local (HHW) representative to learn the regulations in your state or go to Earth911 to see if a program exists in your area. Most of us who cook at home know that pouring used cooking oil down the drain is dangerous not only for your own pipes but also for the environment. Used cooking oil, once poured down the drain, can create massive “greasy globs” that stir up all kinds of trouble in sewer systems and ultimately contaminate local water treatment plants. 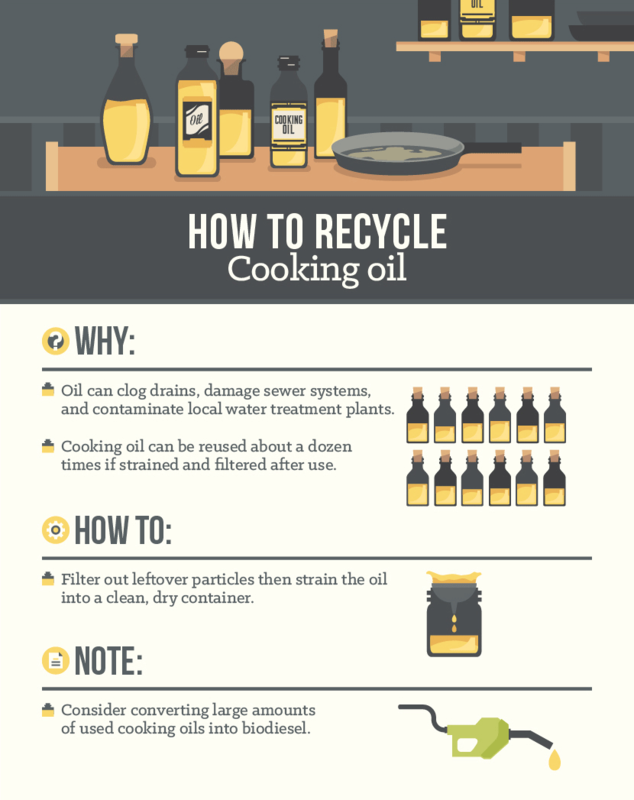 The good thing about cooking oil is that it can be reused a number of times if properly filtered. Although it depends on the type of frying it was used in, cooking oil can be reused quite a bit, generally about a dozen times. Of course, this number will depend on what you fry. Heavily breaded or flour-dredged foods will leave more leftover particles in the oil, limiting its longevity. To save the oil for reuse, make sure you filter out the leftover particles after use. Then strain the oil into a clean, dry container and let it cool. If you saved the original oil bottle, use a funnel to pour it back in. Seal the container and store it in a cool, dry place. After it’s no longer suitable for cooking, oil can be converted into biodiesel. Although the cooking oil recycling process is currently geared toward large restaurant chains, home cooks are also taking advantage of the oil-to-fuel process. If you use large amounts of cooking oil, you may be able to convert it to biodiesel yourself. According to the EPA, fewer than 20 percent of all cellphones are recycled each year, mainly because most people don’t know where to take their old models when they upgrade. However, in most states, major retailers, including Staples and Best Buy, offer either in-store or mail-in recycling options. In addition, a number of charitable organizations will accept used phones to provide for someone in need. 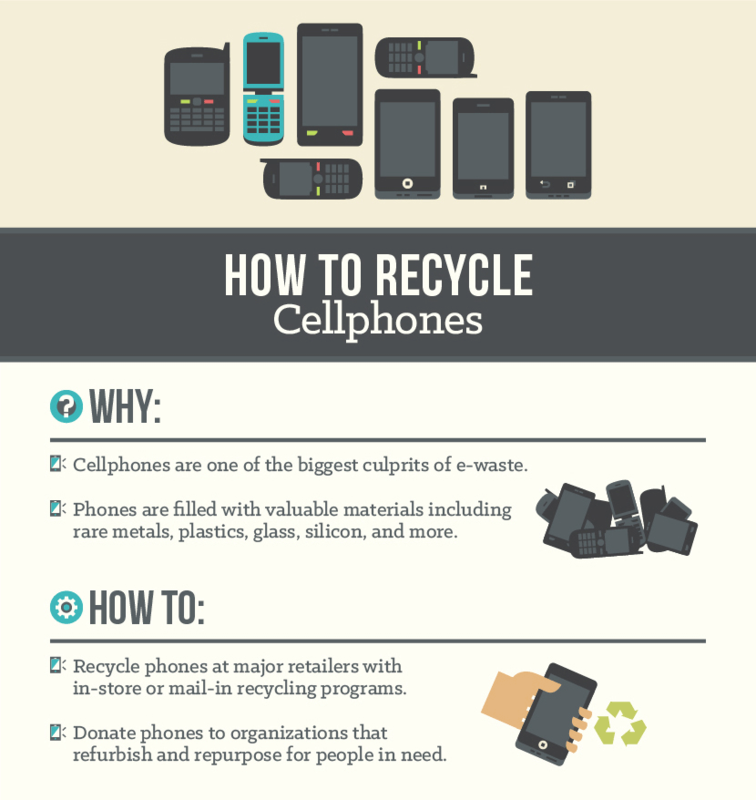 Eco-Cell is a non-profit organization that buys back any used cellphone to recycle, benefiting a number of charitable organizations. Go Wireless, Go Green works with a number of cellphone charities. The Wireless Foundation refurbishes old cellphones for domestic-violence survivors. Cell Phones for Soldiers repurposes old cellphones to provide cost-free communication services to active military personnel and veterans. Although there are some exceptions, most common computers and monitors are manufactured with harmful levels of mercury, lead, arsenic, and other dangerous metals that can hurt the environment. If you recently upgraded to a newer computer, take some time to recycle your old one. According to the EPA, when it is recycled, one metric ton of circuit boards contains 40–800 times the amount of gold and 30–40 times the amount of copper mined from one metric ton of ore in the United States. In case you’re still in doubt about the benefits of recycling old computers, the EPA also estimates that for every one million laptops recycled, the electricity saved is equivalent to the electricity used by 3,657 U.S. homes in a year. 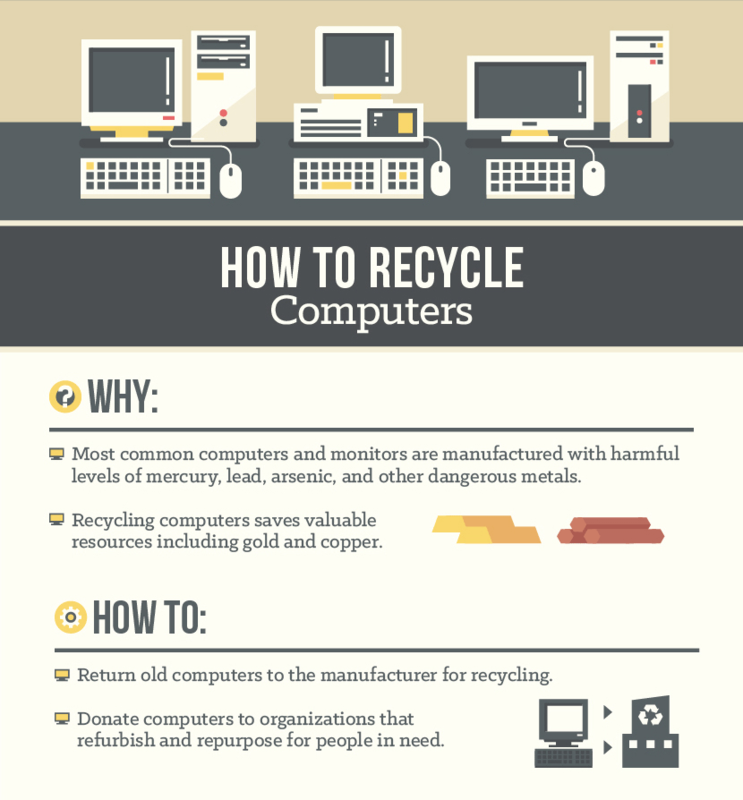 In most cases, you can return old computers to the manufacturer for recycling. For a list of vendors, check out Greener Gadgets. Cristina.org, which repurposes old electronics to benefit a number of non-profit organizations. Next Step Recycling, which repairs broken computers and gives them to underfunded schools, families in need, and nonprofits. Recycle for Breast Cancer, which will send you prepaid shipping labels, recycle your old e-gadgets, and then donate the proceeds to breast cancer charities. Similar to small electronics, household appliances including refrigerators, freezers, air-conditioning units, washers, and dryers are filled with valuable metals. However, many of these items also contain dangerous materials, such as Freon and ozone-depleting chemicals, including chlorofluorocarbons or hydrochlorofluorocarbons. When disposing of household appliances such as refrigerators, it’s always best to contact your local sanitation department or hazardous waste collection site and arrange for a pick-up. 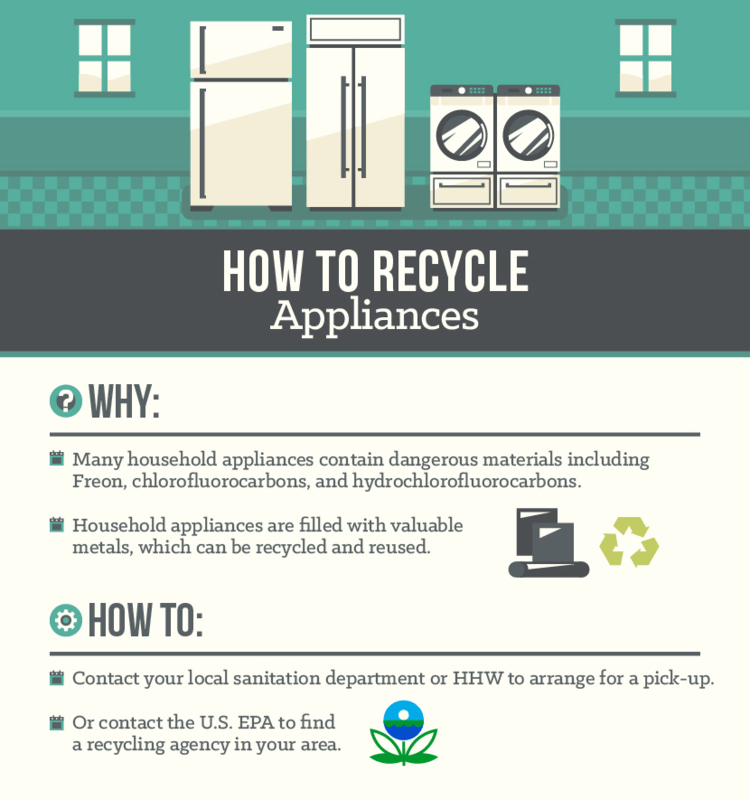 If you are still in doubt, contact the U.S. EPA, which runs the national Responsible Appliance Disposal Program (RAD), for help finding a recycling agency in your area. Although makeup can make you beautiful, expired cosmetics can be pretty ugly for the environment thanks to the many chemicals used in these products, such as coal tar, ethoxylated surfactants, formaldehyde, lead, oxybenzone, and many more. Green cosmetic companies offer an option to avoid further contaminating the environment with chemicals. If you need to dispose of old or expired makeup, it’s best to drop off clean plastic, metal, and glass containers to a local recycling center. 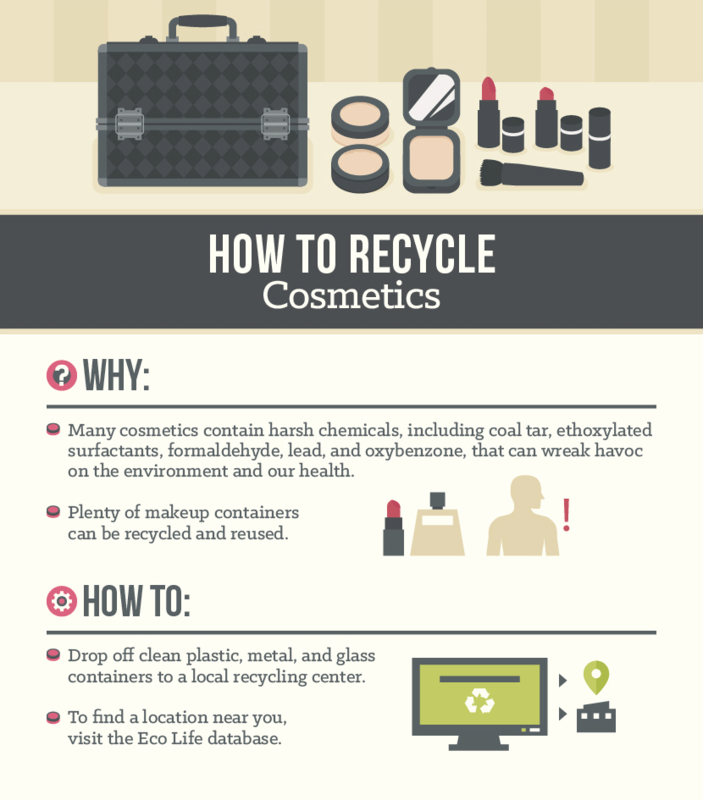 Lipstick tubes and makeup containers are typically made of plastic #5, which is usually recyclable. Even aerosol cans can be recycled. Some makeup retailers have drop-off services for used make-up containers, and many companies have mail-in recycling programs. To find a location near you, Eco Life has a useful recycling database for U.S. and Canadian centers. 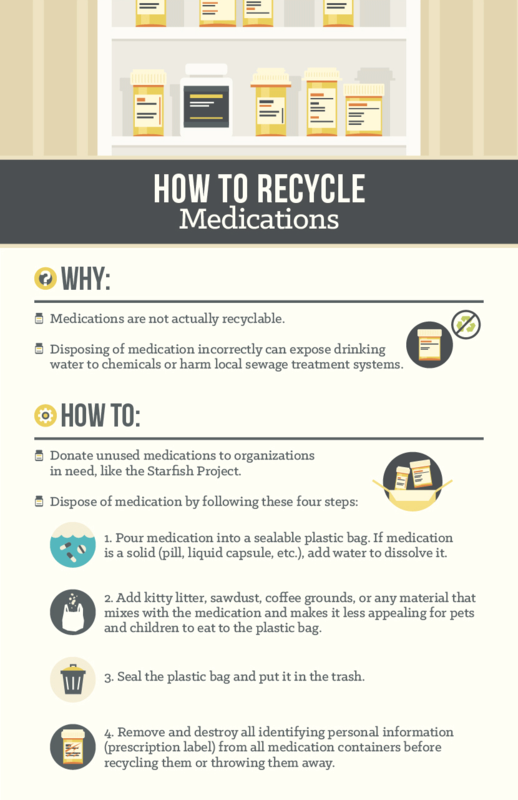 For the most part, any type of medicine is simply not recyclable. However, most pharmacies will take back expired medications. The medications will then be incinerated. In addition, some government programs accept a number of medications. Consult Dispose My Meds to find a medication disposal program in your area. 1. Pour medication into a sealable plastic bag. If the medication is a solid (pill, liquid capsule, etc. ), add water to dissolve it. 2. Add kitty litter, sawdust, coffee grounds, or any material that mixes with the medication and makes it less appealing for pets and children to eat. 3. Seal the plastic bag and put it in the trash. 4. Remove and destroy all identifying personal information (such as prescription labels) from all containers before recycling or throwing away medications. Whether you’re an avid recycler or not, properly disposing potentially hazardous waste – from electronics and medications to appliances and paint – is just as important for the environment as cashing in on bottles and cans.